YouTube is the leading provider of video content on the Internet. With over 1 billion unique subscribers, YouTube is the perfect place to increase exposure for any dealership. A Nielson study found that more 18-34 year olds watch YouTube videos than they do television. With that many viewers your postings are sure to get more visibility. Posting videos on YouTube can take crucial time out of a work day, but with the automatic posting feature with WebManager, the time is saved. 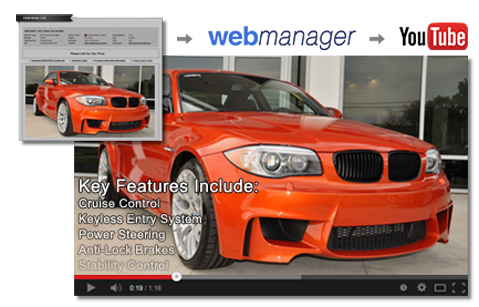 Built into WebManager is the option to automatically post vehicle videos straight to YouTube. Once your vehicle posting becomes live it automatically gets posted to YouTube with the vehicle’s description, a direct link to the vehicle advertisement and a backlink to your website. Your vehicle posting description will automatically be exported to YouTube as well. Imagine increasing vehicle listing rankings on Google and online marketplaces. With your websites links automatically being posted to YouTube, your website just might enjoy being at the top of Google searches. Direct links to your site and vehicle postings on YouTube will increase your websites SEO thus bringing more traffic and visibility to all of your sites and postings.